Vintage Coexist Obama/MLK Day Inauguration design. While supplies last. 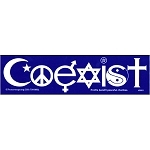 Peacemonger s Full Color Bumper Stickers are always bright and beautiful. Our selection of Full Color Bumper Stickers are all printed right here in America.These Color Bumper Stickers are printed on durable high quality vinyl. This Sticker is weather resistant and will last for years. All of our Full Color Bumper Stickers come with an unconditional, 100% satisfaction guarantee. Measures 10.25 x 3 inches.